This fully revised and updated resource helps teachers and caregivers address the challenges of caring for children with chronic health conditions and special health care needs in child care and school settings. The health issues covered include chronic illnesses, acute situations, and selected developmental and behavioral problems, with a special emphasis on children with special health care needs. More than 50 quick reference sheets on specific conditions provide teachers and caregivers with guidance on how to help at a glance. New quick reference sheets include Childhood Obesity, Eczema, Fetal Alcohol Spectrum Disorder, Food Allergies, Gastroesophageal Reflux Disease, and more. The guide addresses topics with universal relevancy such as Care Plan development and implementation, medication administration, emergency planning, and handling symptoms that develop while on-site. Also included are ready-to-use sample forms, letters, and Care Plans, for easy implementation. 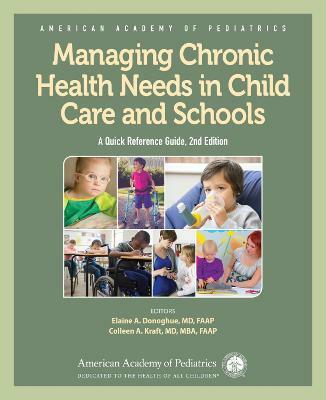 "This is an excellent, practical, quick reference for preparing care plans for children with chronic health needs (chronic illness. developmental problems) who are in child care and school. I highly recommend this valuable resource to all who are involved in the preparation of care plans for these children." Elaine A. Donoghue, MD, FAAP, is the Vice-Chair for Academic Affairs at Lehigh Valley Health Network and a Clinical Professor of Pediatrics at the USF Morsani College of Medicine. She is past co-chair of the American Academy of Pediatrics (AAP) Council on Early Childhood and the past chair of the Section on Early Education and Child Care. She helped to develop training materials on Medication Administration and Managing Infectious Disease for child care providers through the Healthy Futures program. She previously served as medical director of Healthy Child Care New Jersey. Colleen A. Kraft, MD, MBA, FAAP is the 2018 President of the American Academy of Pediatrics. Her background includes work in primary care pediatrics, pediatric education, and health care financing. Dr. Kraft received her undergraduate degree at Virginia Tech and her M.D. from Virginia Commonwealth University. She completed her residency in Pediatrics at Virginia Commonwealth University. Dr. Kraft's work in early childhood and population health seeks to translate the goals of health equity into medical practice.